Therapeutic horsemanship creates opportunities for our children to use horses as partners as they grow emotionally and physically, as well as gain motivational, vocational and educational skills. Completed in 2011 after a generous donation from the Overton family, the Overton Arena enables our children to participate in therapeutic horsemanship year-round. At Coyote Hill, great emphasis is put on being able to grow as individuals. Children are highly encouraged to participate, but never forced. As the children strive to reach their unique goals in riding, they are taught responsibility and respect for their peers, partners and elders. This can then be reflected not only while riding, but also in their homes, at school, and all other aspects of their lives. Horsemanship opens the door for communication and dictates a certain amount of healthy reliance on authority figures, as horsemanship is not inherent. Horsemanship also promotes independence, as the student learns to rely on his or her own abilities. The benefits of therapeutic horsemanship for our children include strengthening cognitive and sequential thinking, problem solving, confidence and self-esteem building, and exposure to positive role-models and mentors. Using the horse as a partner provides a safe environment where the student is able to reveal his or her emotions. Goals are established and the progress of each child is recorded. Capabilities and behavior are continually documented through progress notes during the child’s riding career. After a child discontinues the program, a final assessment determines the total amount of progress. Our Equine Program manager, Rebecca Buchholz, explains why the program is so effective, “Horses are, for all practical purposes, one ton four-year-olds with no verbal skills. Some days they are more than happy to comply with everything you want to do. Other days, they have their own ideas. “Kids learn the important skills of being emotionally aware of what the horses are doing, but also aware of what nonverbal cues they are giving the horses. Is the horse running away from them because it wants to play a little, or is it running away because it’s sensing anger from the child? If you yell at a horse when it is frightened does that solve a problem or make it worse? If you don’t communicate clearly with a horse what you want, is it the horse’s fault, or the rider’s fault? A child can safely practice these social and emotional skills with horses because they’re considerably more forgiving than people! Opportunity in Overton from Coyote Hill on Vimeo. 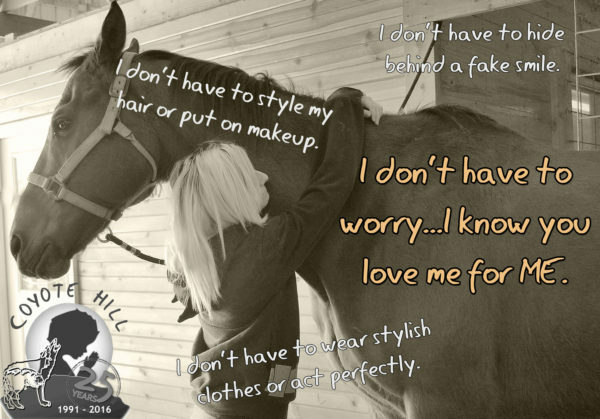 If you’d like to be of assistance, we have an Equine Program Needs List at the bottom of our Needs List page.